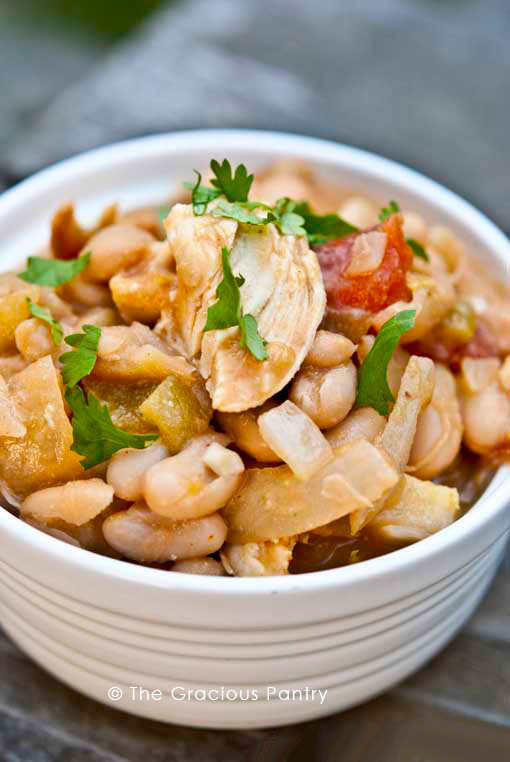 This clean eating slow cooker white chicken chili is perfect for dinner tonight! Today I have a wonderful recipe for you from guest blogger Vicki Griffin, R.N., B.S.N. My name is Vicki and I am an avid cook! Sounds like an addiction, right? Well it is! I’ve been cooking since I could reach the countertop with a stool – helping my mom and grandmothers whenever I could get my hands in. I’m an experimenter in the kitchen, and I find measuring cups are my worst enemies. I try my best to use them, but they only seem to make their way out when I’m baking. I started my food blog, Falling For Food last August to keep myself busy while searching for a nursing job. It’s been quite an adventure! I am thrilled to have Tiffany’s fans try my recipe, considering I am such a huge fan of hers! Ok, now onto the recipe, Clean Eating White Chicken Chili. My mom and I have been making this for as long as I can remember. At this point I can make it with my eyes closed! I’ve made it for countless friends and family members. It’s always a huge, frequently requested hit, AND its won a chili cookoff. Have I sold you on it yet? It’s incredibly easy to make with a huge flavor payoff. I don’t eat any red meat, so this recipe really satisfies my cravings for a big, comforting bowl of chili. The best part? The leftovers are even better and it freezes beautifully. So go ahead, make a big batch and have it ready whenever you need some comfort in a bowl. This wonderful chili is perfect for a cold night when all you want to do is warm up your body and soul. Sauté the onions and garlic in a pan with the extra virgin olive oil until the onions are translucent. Put the tomatoes, chicken, beans, chiles, chili powder and cumin into the slow cooker. Once the onions and garlic are cooked, add them as well with 1 ½ cups of chicken stock. Stir well. Cook the chili 4-5 hours on high or 6-8 hours on low. About an hour before serving, add the 1 cup of cheddar cheese and salt and pepper to taste (and more chili powder or cumin if you’d like!). Add optional toppings if you so choose. I make something very similar to this and it is AMAZING. The flavor is huge and the best part is under weight watchers it is about 2 points! I don’t add the cheese but fat free sour cream instead. I will try your version tonight! Tracy – I hope you enjoy it! Just watch out for the fat free cream cheese. They have to add a lot of not-so-nice stuff to make it still taste edible. Tiffany, the photos are amazing! Thank you so much for sharing! I hope everyone likes it as much as everyone that has tried it in the past! Vicki – Thanks so much! It’s definitely a popular recipe. Some people have cooked it already today and they love it! This is a family favorite! We add a bit of cilantro and lime juice, too. Happy cooking! Michelle – That’s fabulous! I’m so happy you enjoyed it! Mnelmnel – I tried installing ziplist on my blog and it was a complete disaster. Maybe some day in the future I’ll try it again. I apologize if you’ve already answered this…but it looks like we don’t drain and/or rinse the canned beans, is that correct? You can if you want, but I didn’t. I sure did! I love shredded chicken. just wondering if this is spicy? i have a two yr old and not sure if he would eat ir. Not especially, but you can leave out anything that might be too spicy. I’m glad you enjoyed it! And you’re right, some nights, dinner just wouldn’t be on the table without my slow cooker! Yup. It really is. But if you’re worried about it, start with 1 or 2 tbsp. You can always stir in more later. I would cook them first. Then make the recipe. There isn’t enough liquid to cook them from dry, even if they are soaked. There also isn’t enough cooking time for dry beans. Have this in the slow cooker right now! Can’t wait I think I will love it! This may be a dumb question but is the chicken breast raw when you place it in the slow cooker or cooked?? Trying this recipe for the first time. Is it really 1/4 cup of chili powder? Just seems like a lot. Yup. But if you don’t feel comfortable with that, start with 2 tablespoons instead. You can always add more after cooking. Can you eat a side dish with the chili and if so what would be a good one? What amount would you eat? Sure! A salad would be great. I am using uncooked ground turkey….does it matter? Thank you! It’s fine, just be sure it’s completely cooked. You may have to cook a bit longer. Keep an eye on it. So the chicken is raw going into the cooker, but not diced or otherwise cut up?? Made this the other night with 1/2 Rotissari Chicken pulled from the bone. It was wonderful! I only cooked it on low about 2 hours to blend the flavors since the chicken was cooked. I did leave out the green chilis (forgot to get them at the store!) but it turned out perfectly for my mild loving family. This turned out wonderfully. I used dry beans in place of canned. I had all the ingredients on hand, I love when that happens! Topped with lime, cilantro, cheese and jalapeno. Thanks for the recipe, it’s a keeper. I made this a few nights ago and was a bit disappointed. The flavor was great, but it looked more like chili than white. Most white chicken chilis have their own distinct look to them, much like the one in the picture. Mine looked like regular chili except chicken instead of beef. I followed the recipe exactly, but did I miss something? Erienne – That’s really odd! I’m not sure what could have changed the color. Are you sure you didn’t change anything at all? I’m glad you found it tasty though! Yes the only thing I left out was the chilies as husband cannot have a whole lot of spice right now. I have tried several recipes here though and love them all! Tonight we had the mushroom rice casserole. So good and so easy! Hi! This looks delicious! My husband has some food allergies…dairy being one. Do you think I can leave out the cheese, and had it on the side as a garnish? How long do you recommend cooking it in the crockpot on low if the chicken is precooked? Rachael – I’m not sure you would want to use pre-cooked chicken in a slow cooker. The meat will dry out by the time everything else gets cooked. You could check it after 2-3 hours, but again, not sure how that would turn out. I had the same problem as Erienne. The 1/4 cup chili powder is what changes the color. Is there some sort of white chili powder that is supposed to be used instead of regular chili powder? KC – Not that I know of. I leave out the tomatoes and the chili powder. Tastes just as great and it will give you a nice white chili look. Those of you who got the red chili color, did you drain and rinse your white beans? I did, and I bet anything that contributed to the stronger red chili look rather than white chili. Next time I will try not draining or rinsing them. Tiffany – Why would that contribute? Was the juice red? I noticed the serving size is 11….how many cups (or part of a cup) is a serving? K – It should be 11 cups. Awesome! Thank you! Your recipes are so incredibly helpful! Where is the nutrition info on this recipe? Jill – I no longer provide that information because I couldn’t provide accurate numbers. But you can easily plug the recipe into an online calculator. I highly recommend MyFitnessPal.com. They make is super east to import recipes. I’m making this chili tonight. Can you please tell me the amount of calories and sugar grams. Kimberly – You would have to enter the recipe into a recipe calculator. I like the one at MyFitnessPal.com. They make it easy to import a recipe. 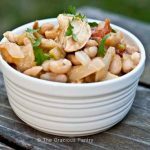 Treaclee – Any white bean can be used. Cannellini beans or even navy beans will work as well. Did you drain the juice from your tomatoes before adding them? I am making the White Chicken Chili recipe this week. The ingredients list 1 cup of grated cheddar cheese but the instructions say add the one cup of Mexican cheese. Which gives a better chili flavor or can I use either? Cyndie – Sorry about that! Either one will work. Just depends on the flavor you want. Mexican cheese blends would be lighter in flavor, while the cheddar would obviously give a stronger cheddar flavor. I prefer the Mexican blend, but either way.